What Is DA Form 1970? 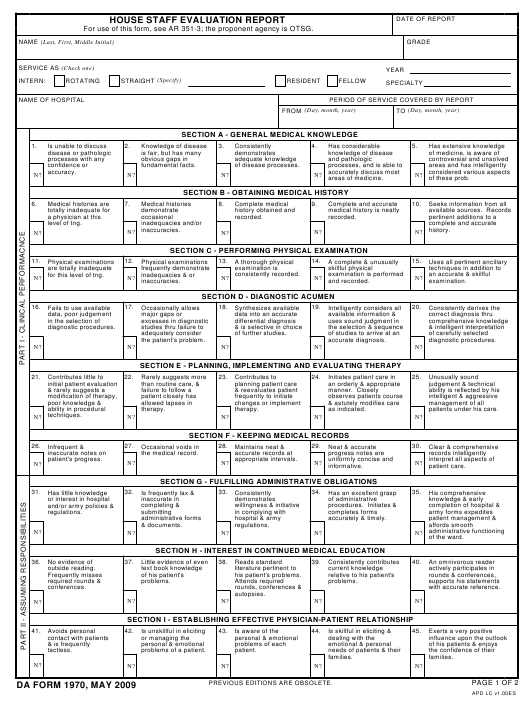 DA Form 1970, House Staff Evaluation Report is a non-mandatory document associated with the evaluation of progression and performance required for each Graduate Medical Education (GME) program participant. The latest version of the form - sometimes confused with DD Form 1970, Motor Equipment Utilization Record - was released by the Department of the Army (DA) in May 2009 with all previous editions being obsolete. An up-to-date fillable DA Form 1970 is available for download down below or can be found on the Army Publishing Directorate website. For use of this form, see AR 351-3; the proponent agency is OTSG. for this level of tng. The form requires the name, grade, intern status (rotating or straight) and specialty of the participant along with the name of the hospital and the period of service covered by the report. Part I of the DA 1970 covers clinical performance and contains Sections A through F. Each section contains a scale from 1 to 4. T he participant's performance is numerically rated on each criteria within the provided range. Section A assesses the level of general medical knowledge. Section B is for evaluating the handling of medical history records. Section C specifies the way the physical examinations are performed. Section D evaluates diagnostic acumen. Section E describes how well therapy is planned, implemented and evaluated. Section F refers to the way medical records are kept. Part II - Assuming Responsibilities - contains three more sections. Section G assesses how well administrative obligations are fulfilled. Section H shows the level of interest in pursuing further medical education. Section I of the DA Form 1970 evaluates the participant's ability to establish an effective physician-patient relationship. Part III - Personal Qualities Assessment - covers Sections J through M.
Section J evaluates the attitude and appearance. Section K assesses the effectiveness of cooperation. Section L is for evaluating the levels of leadership and responsibility skills. Section M is for assessing the accuracy of self-evaluation and the role of the consultant. Part IV of the form calls for an overall evaluation. This part requires counseling with the House Officers done by the Rater. Part V contains recommendations for additional training in case any is needed. Part VI contains an additional block for a narrative description of the participant's performance and personal qualities. The DA 1970 needs to be verified by the signatures of the Service Chief, the Director of Medical Education and a hospital or facility commander.